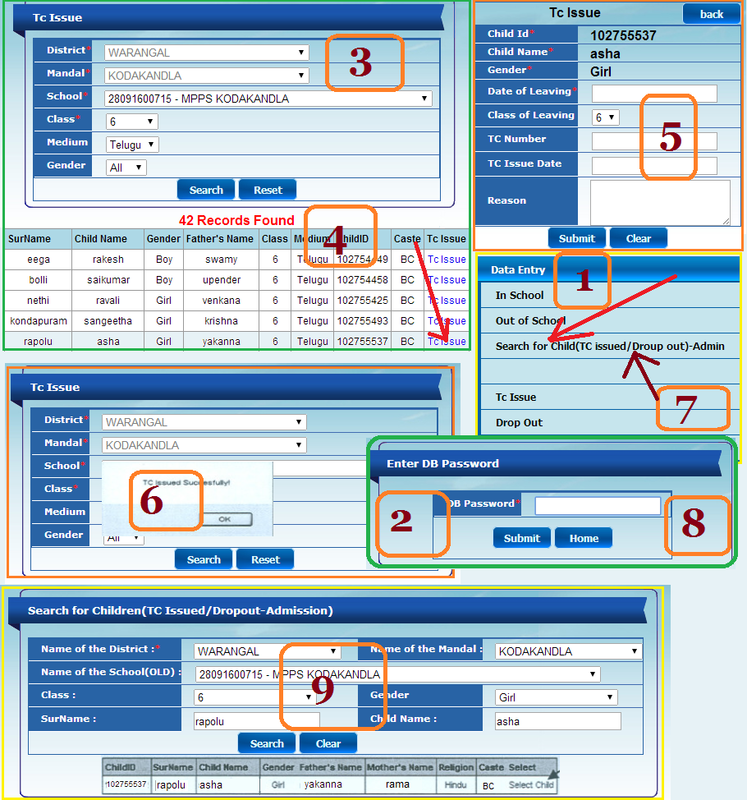 Uploading of Child Info Data on SSA Child Info Web Portal: SSA AP Child Info Web Portal is childinfo.ap.nic.in. TSSA Child info Web Portal is childinfo.tg.nic.in. Online Monitoring of School Visit Reports through Child Info Website . Guidelines and Instructions for Uploading Child Info Data on childinfo.tg.nic.in OR childinfo.ap.nic.in. Child info and Child Tracking System. Instructions on Child Info Updation and Aadhaar Enrolment and Validation: Enrollment of student with Aadhar Number in child info website. 1. Sample schools selected for VIII class for conduct of NAS 2018 is confirmed by SCERT. 2. Childwise information of sample schools uploaded in childinfo website attached for confirmation. 3. Children having Aadhaar to be confirmed by the School Headmaster. 4. Children not having Aadhaar list also enclosed to take Aadhaar Number in nearest Aadhaar Enrollment Center immediately. 5. more than 5000 children of sample schools of VIII class children Aadhaar number not updated in the child info website (List enclosed). 6. If Aadhaar number is not available to the sample School Children, MIS Co./ Nodel Officer should Coordinate with concerned School Headmaster to take the children to the nearest Aadhaar Enrollment Center to issue Aadhaar Number. 7. 100% Aadhar seeding of sample Schools should be completed in childinfo website by 10th of this Month i.e., (10.10.2018). 8. The DEOs are requested to entrust of work of confirmation of children names with Aadhaar No. to the MIS Coordinators/ Nodel Officers who attended the training programme at Bangalore. 9. Daily status to be updated through email to the plgmists@gmail.com. 10. The information of sample schools and children information with Aadhaar no. to be kept as confidential. Misuse of Aadhaar No. leads serious action as per rules. C and DSE Telangana - Rc.No.3238, Dated:22/09/2018 :: Sub: TSSA, Hyderabad - Planning & MIS - Completion of 100% Aadhar enrolment in Childinfo website - Declaration Certificate submission - Reg. Read:- 1. D.O.Lr.No. 11-38/2018, Sch-5(Pf)of Anilswarup, Secretary, MHRD. 2. This office Proc.Rc.No.3238/TSSA/MIS/T7/2018, dt:ll/09/2018. The attention of all the District Educational Officers & Ex-Officio District Project Officers, SSA in the State is invited to the subject read above and they are informed that the last date of Child info with Aadhar enrollment is extended up to 30th September 2018. The DEOs are directed to instruct the MEOs to take Declaration Certificate from School Teachers/Headmasters/Principals on 100% completion of Child info with Aadhar enrollment and submit the consolidation of the declaration certificates so obtained along with his/her certification at the DEO office by 30th September 201 7 duly making spiral binding of such declarations. In turn all the DEOs ate directed to verify thoroughly the spiral bounded declarations submitted by MEOs under his control and submit along with his/her certification of all the declaration certificates obtained to the State Office by 5th October 2018 in person without fail. The DEOs are directed to Coordinate with DIOs/EDMs working under District Collectors for 100% completion of Aadhar Enrollment. Mee Seva Director arranged Special Centers for Aadhar Enrollment of the School age Children and as such the DEO is directed to give instructions to Headmasters/Principals to utilize the services of Mee Seva for 100% Aadhar Enrollment. Further it is informed that the collection of UDISE 201 7 data starts from 1st October 2018 based on data as on 30th September 2018. The UDISE DCF will be generated with child info database. After 30th September 2018 corrections in Enrollment will not be permitted in UDISE DCFs. The following information is to be furnished in declaration Certificate along with the signature of Class Teachers /Headmasters/Principals from School Level and MEOs Signature from Mandal Level, with DEOs Signature from District Level by 5th October 2018 without fail. C and DSE Telangana: Proc.Rc.No1335/TSSA/MIS/T7/2014, Dated: 28-06-2018 :: Sub : TSSA, Hyderabad - Enrollment of student with Aadhar Number in child info website-reg. The attention all the District Educational Officers & Ex-officio District Project Officer in the State are informed that, migration of data from One class to Another class collected at NIC. 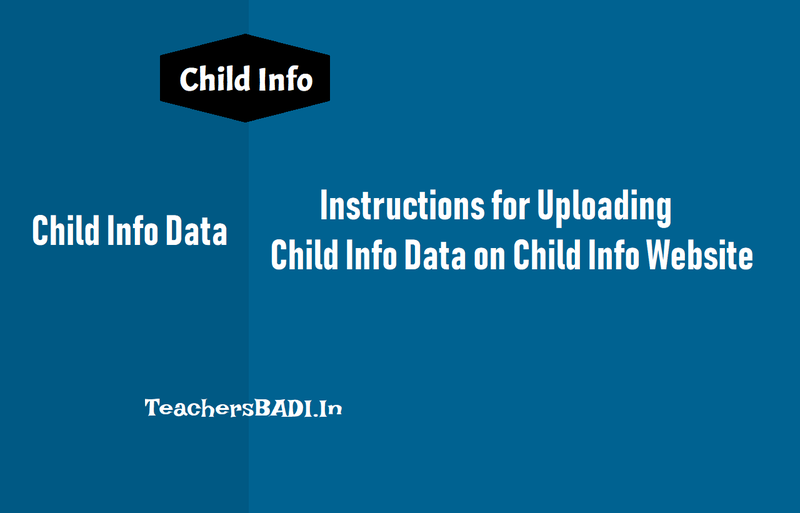 Newly enrolled child wise information in 35 column format prescribed by GOI to be collected from school point and upload the information in child info website along with Aadhar Number. Therefore, all the District Educational Officers & Ex-Officio, Project Officers in the state are directed to instruct Mandal Educational Officers I MIS coordinators, Head Masters of the concerned schools to collect 35 column information of New admissions and upload in childinfo website along with Aadhar Number on or before 15.07.2018. Child Info Website was developed and created by the National Informatics Centre(NIC), Hyderabad. This website had been launched. This website is useful to Upload of Child Information Data for Visitors. Online School Visit Format Website for Obtain data on daily attendance of school Children, Teachers and Infrastructure in the State on daily basis through online purpose. It is useful to Online Monitoring for Higher Officials. 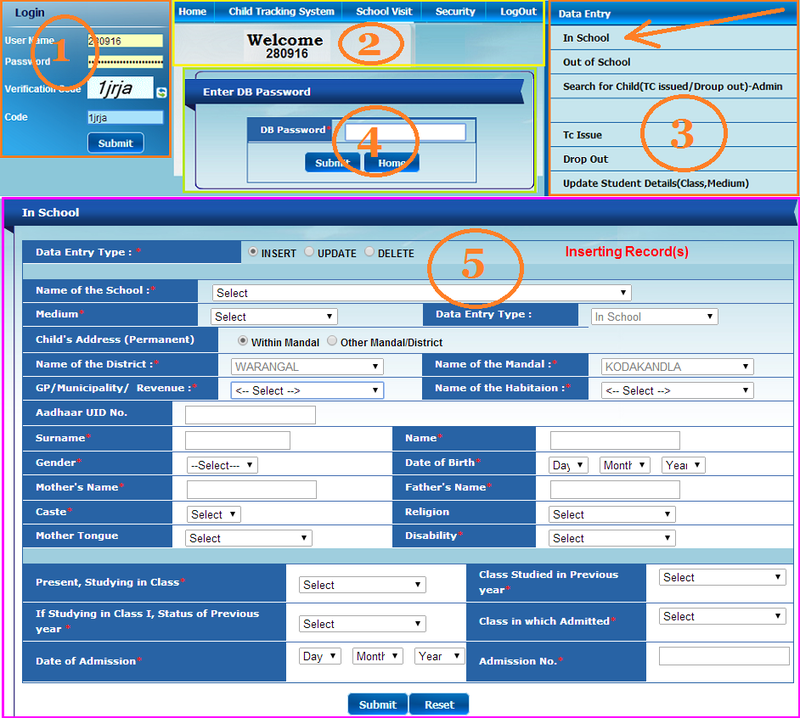 Officials have made some changes on Child Info Website for Child Information data entry on this Website for this academic year. CHILD INFO WEBSITE officials have given instructions to all the district officials for entry of child data on website. So Data entry Operators should read and follow the instructions for data entry on this website. DB password have been activated on 1st August, 2014. 2. Please update and the first TC Issued and Drop out details under TC Issued Module and Drop out Module in the Child Info web site. 3. If any child TC Issued or Drop out Do not entered details once again. If entered it comes duplicate. So please select those students already enter or pick up in Drop out Box Module in Child info Web site. Open the Child Info website by entering the URL address childinfo.ap.nic.in for Andhra Pradesh State and childinfo.tg.nic.in for Telangana State. Then will be appeared the child info official web portal. District Users or Mandal Users or School Complex Users can access the website with their respective User Name and Pass word. 1. Then Click on the Child Tracking System. First enter the data of newly joined children in this academic year. In this Section, The officials have requested to all the MIS Coordinators and Cluster resource Persons to modify the enrollment of Government Schools and enter the assessment marks in the Online Website. They must visit one School every day and Enter the School Particulars in this website also they must modify the enrollment status in the website. 3. Select on In School and Enter DB Pass word, then will be appeared a new page. 4. Enter new student details in the appropriate columns. Select the TC issue option and enter DB-PASSWORD, then the new screen will be appeared. 3. Select a student who take T.C(RecordSheet). Enter the details and the we will be got New Page. T.C No. : TC number is available to VI to X students only. Admission number of student as TC No. 4. SUBMIT these details of new page will be appeared. 1. Go to Search for Child (TC issued/Drop out)-Admin. Now all TC Issued children Names are appeared. 3. Now we Click on Select Child the previous personal details of student is appeared. 4. Now we give the present Educational institute status of the TC issue students and submit. 5. When we enter all details we seethe following screens will appear. We can check that student name is go to the NEW school are NOT. 2. Now the new screen will be appeared. How to upload 67 columns of child info?